Heat the oven to 450 degrees / 230 degrees / Gas 8. Lightly grease a shallow flat baking tray. Place the flour, baking powder, and salt in a bowl and stir together. Rub in the butter until the mixture looks like large breadcrumbs. Add the sugar and dried fruit. Stir well. Mix in the beaten egg and milk to form a soft dough. Turn out on a lightly-floured surface and knead until the dough forms a large ball. Roll out to 1″ thickness. Press out 6-8 rounds with a pastry cutter. Place the rounds on tray. Brush with the egg glaze. Place in the middle of a hot oven for 12 – 15 minutes until golden brown. Remove to the cooling rack. Serve warm with butter – or cold with jam and thick clotted cream! 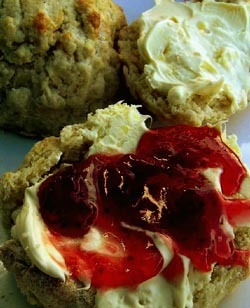 This entry was posted in Recipes and tagged Fruit Scones, traditional recipes. Bookmark the permalink.